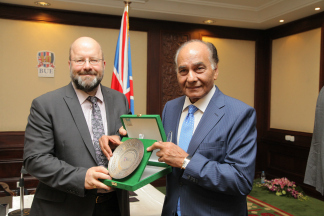 Philip Lockett, Pro Dean in the Faculty of ESBE and Professor Phil Cardew, Pro Vice Chancellor were among the attendees in Cairo to celebrate the tenth Anniversary of BUE and the Inauguration of its proposed partnership with LSBU. Mr Mohamed Farid Khamis, Chairman of the Board of Trustees announced the partnership at the gala dinner: "Following ten years of laying firm foundations and assuring standards, our strategy is to enhance the university in three areas; employability, the student experience and research and enterprise." "With this in mind, we could have no better British partner than London South Bank University, since it excels in all three areas." LSBU is already a validating partner for Petroleum Engineering & Gas Technology and Chemical Engineering and the planned enhanced academic collaboration will expand to graduate and undergraduate programmes in other Engineering areas, Business, Economics, Political Science and Mass Communication. "We have been working together for the last two years and we have learnt much from each other," explains Philip. "Our agreement to expand the breadth and depth of the partnership to include research collaboration and joint enterprise activities as well as many more areas of study will enrich both institutions. "It will provide many opportunities for students and staff to enhance their education and experience." It is planned that from September 2015, LSBU will gradually take responsibility for the validation of most BUE courses. The collaboration brings many opportunities for both parties, including joint international Research and Enterprise projects to address global issues with a strong focus on sustainability and energy.